With your decking in place, it is time to prepare the tumbling surface. 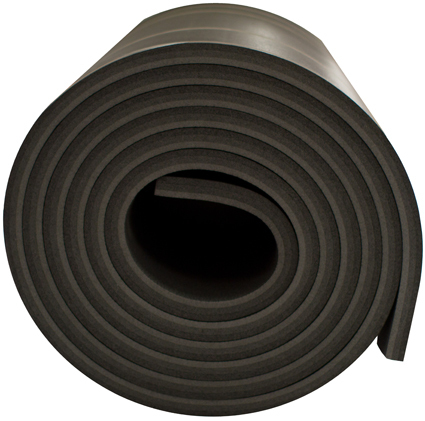 If you choose not to go with a Carpet Bonded Foam or Flexi Roll, we suggest a flexcell foam. We offer Trocellen foam here. 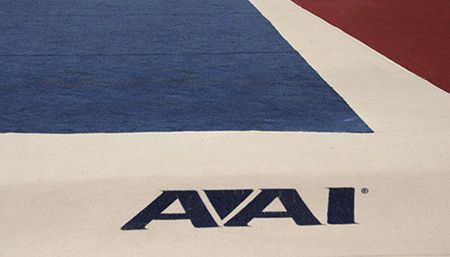 It has long been the standard for sports flooring since its introduction some 35 years ago. This product has excellent energy absorption, outstanding compression, cushioning and fatigue resistance. 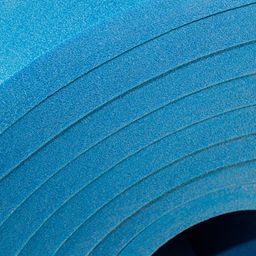 Flexcell foam may come in a variety of colors (color is not an option). It normally comes in 6' x 42' strips and in thicknesses from 1 1/4" and 1 7/8". If you are using with a spring floor, generally 1 1/4" to 1 7/8" is recommended. You will need to cover this with a floor exercise carpet. The last two items on the above chart are EVA Modified Trocellen. This is step up in the rebound performance, this top-grade prime polyethylene provides superior shock absorption and long-lasting foam life. Available in individual rolls or complete floor system. EVA provides a softer feel and more bounce. It is blue, not gray. > Both the 1.5" and the 2" EVA Foam are constructed of 100% EVA foam - not a combination of Trocellen and EVA. 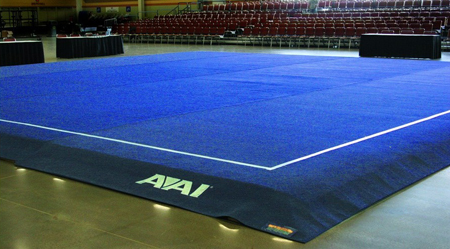 Performance area is 39' 4 1/2" (13.8m) Square Newport Blue Carpet. The outside surrounding border is 3' (91cm) wide white Carpet. The Carpet backing is polypropylene and has a finished weight of 60 oz. (Carpet passes the ASTM-E84 Radiant Panel Test.) The Carpet comes in four sections and utilizes 4" hook fasteners for attachment to eliminated seams. Overall Carpet size is 45' 4 1/4" (13.8m) square. All outside edges are bound to help prevent wear and unraveling. Weight is 1,132 lbs (513 kg). Price is $10,930 + freight. Overall size is 45' (13.7m) square Newport Blue. 2" (5cm) white tape is included to mark off the performance area. Carpet comes in 4 sections and utilizes 4" (10cm) hook fasteners for attachment to eliminate seams. Carpet backing is polypropylene and has a finished weight of 60 oz. (Carpet passes the ASTM-E84 Radiant Panel Test.) All outside edges are bound to help prevent wear and unraveling. Weight is 984 lbs (446 kg). Price is $8,370 + freight. Same as the American Elite Carpet (above) but the overall size is 42' (12.8m) square Newport Blue. 2" (5cm) white tape is included to mark off the performance area. Carpet comes in 4 sections and utilizes 4" (10cm) hook fasteners for attachment to eliminate seams. Carpet backing is polypropylene and has a finished weight of 60 oz. (Carpet passes the ASTM-E84 Radiant Panel Test.) All outside edges are bound to help prevent wear and unraveling. Weight is 703 lbs (319 kg). Price is $7,770 + freight. We will be glad to provide you with a delivered price for any part or all of your floor. Just describe what you need along with your city and zip code and we will calculate your total cost. We will be glad to quote the spring floor decking also.